Torn plantar plate causing a gap between toes. Gapping toes. What can be done about a torn plantar plate causing a gap between toes? Prior to a tear to the plantar plate occurring, the toes will still be straight and there will not yet be gapping between toes. The area of the foot marked in diagram 2, the head of the 2nd metatarsal bone, will probably feel painful or bruised. It is very likely that this area will have thickened skin as the foot copes with the increase in pressure at this spot. A layer of callus will probably be present as a result of the increase in pressure. If the mechanical issues are addressed at this time, it is very likely that further damage resulting in a tear can be avoided by making the foot pressures move back towards normal again. This would be done by the use of orthotic devices. If a tear has just occurred in the last few weeks, the area will be painful. A simple pad applied to the ball of the foot with an aperture to the sore area will help a lot to reduce the pain in the short term. In the long term, orthotic devices will protect the area from excessive pressure and reduce the ongoing symptoms of overloading in the forefoot. Unfortunately, surgery is the only method of correcting the gapping between toes. While the physical repair of the tear using sutures is a relatively simple surgery, the placement of the cut through the skin and the resulting scar can cause ongoing problems. Probably for this reason, the surgery to repair a plantar plate rupture is not very commonly performed. Proper advice and consideration is necessary before proceeding to surgery. We suggest that you consult your podiatrist or make an appointment to attend out Podiatry Clinic Brisbane for advice. 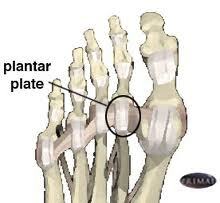 For more information, please browse to our Plantar Plate Info Sheet. Alternatively, use this link to return to the Podiatry FAQs Blog.